Matsumae is located in the southernmost part of Hokkaido. While most cities and towns in Hokkaido weren’t developed until the 20th century, Matsumae’s history goes back much further. Beginning with the establishment of a government office in the 17th century, followed by the construction of Matsumae Castle in the 19th century, Matsumae grew into a castle town centered around Matsumae Castle. To this day, many historical sites and landmarks remain in Matsumae. Surrounding Matsumae Castle is Matsumae park. Famous for its cherry blossoms, it has been selected as one of Japan’s Top 100 Cherry Blossom Spots. 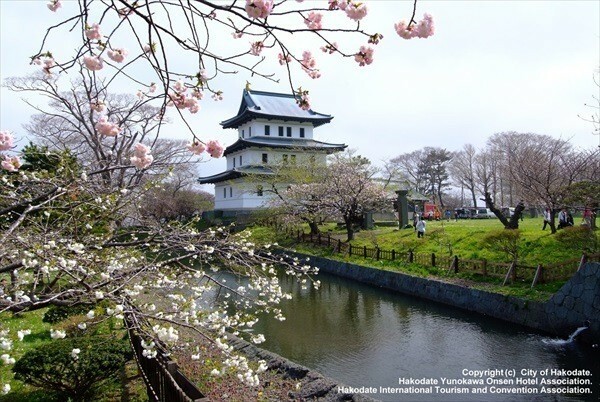 The view of historical Matsumae Castle combined with cherry blossoms makes for a beautiful scene that’s uniquely Japanese. With about 10,000 trees in 250 varieties, Matsumae Park is well worth a visit. The blossoms bloom in late April. In addition, each year from late April to late May the Matsumae Sakura Festival boasts many events while the festival is being held. There’s even a fair where abalone, sea urchin, squid, and many other types of seafood can be enjoyed. Savoring some of Hokkaido’s famous seafood while marveling at the beautiful cherry blossoms will make you feel like you’re in seventh heaven! From the Yakumo Interchange of the Hokkaido Expressway follow Hokkaido Route 67 for about 2 hours and 30 minutes. From Hakodate, follow National Route 228 for about 2 hours. By public transportation: From JR Kikonai Station, take a bus bound for Matsumae and get off at Matsushiro (bus takes around 1 hour and 30 minutes). The park is about seven minutes on foot from the bus stop. Goryokaku Park is very popular tourist destination in Japan. 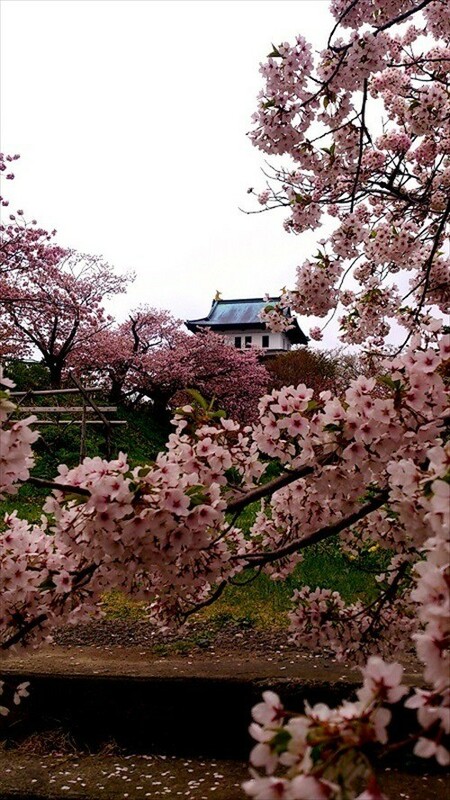 If you visit at the end of April to early May, not only can you take in the usual attractions like the Former Hokkaido Magistrate Office and Goryokaku Tower, but you can also enjoy the cherry blossoms. In Japan, the most common type of cherry blossom is Somei Yoshino (Yoshino cherry). Its flowers are a very pale (almost white) pink. 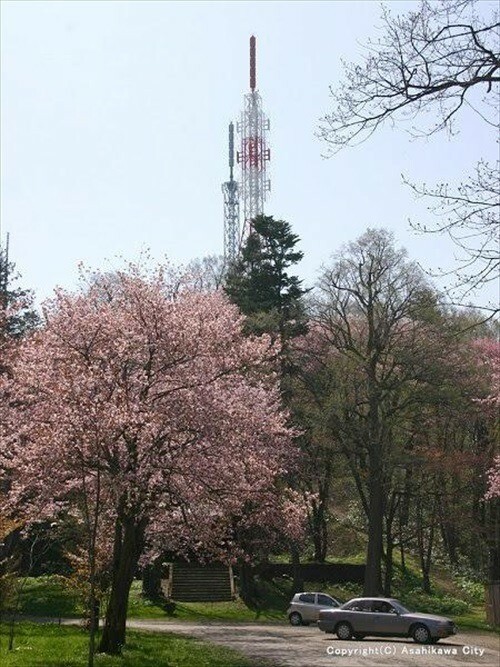 However, Oyamazakura (Sargent’s cherry), with its darker pink blossoms, is more prevalent in Hokkaido. 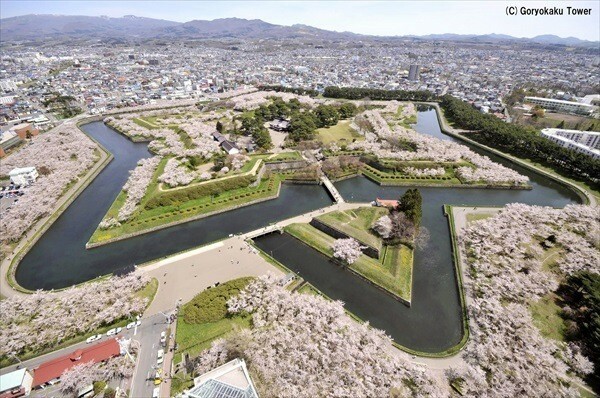 Despite this, the cherry blossoms at Goryokaku consist of about 1600 Yoshino cherry trees. Their small, pale flowers are a rarity in Hokkaido. There are many ways to enjoy the cherry blossoms at Goryokaku. Many people enjoy barbecuing jingisukan (a Hokkaido specialty of grilled mutton) or taking in the trees as they are lit-up at night. (Please note that fire is normally prohibited in the park. It is only allowed during cherry blossom season). 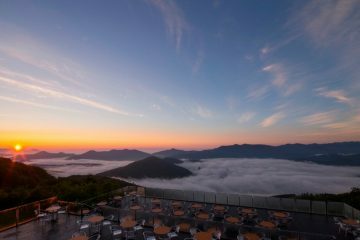 Noboribetsu Onsen is one of Japan’s many hot spring resorts. 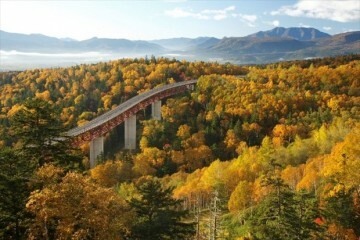 Recently it has been gaining popularity with tourists from other countries. Noboribetsu’s famous cherry blossom spot is the Flower Tunnel. 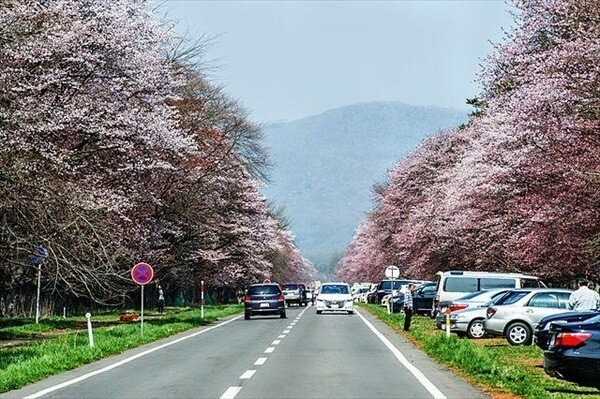 In mid-May, the road leading from the Noboribetsu Higashi Interchange of the Hokkaido Expressway into the center of town gets covered in a veil of cherry blossoms, creating a “flower tunnel”. The flower tunnel came to be around 80 years ago, when the residents of Noboribetsu planted around 2,000 Sargent’s cherry trees. The tunnel stretches for about 8 km, and the contrast between the blossoms and the blue sky makes it a popular place to enjoy a leisurely drive. 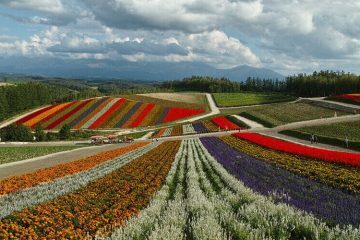 Noboribetsu is located around one hour from New Chitose Airport by car, making it a great place to visit by rental car on the first or last day of your visit to Hokkaido. The cherry blossoms along Shizunai Nijukken Road are often said to be the best row of cherry trees in Japan. In addition to being on the list of Japan’s Top 100 Cherry Blossom Spots and Japan’s Top 100 Roads, it’s also a Hokkaido Heritage site. 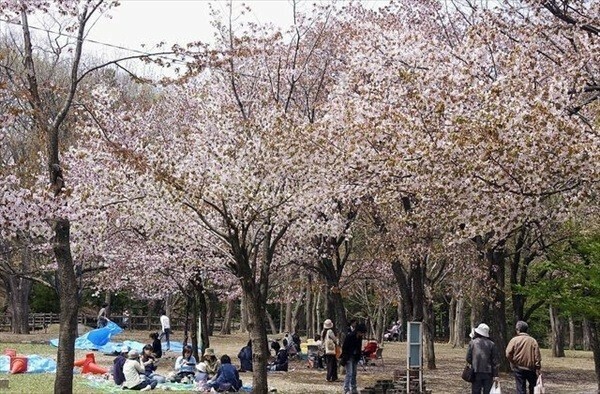 With approximately 3,000 trees consisting mainly of Sargent’s cherry, 200,000 people from all over Japan visit in early May to see the blossoms in their full glory. For those planning to visit by car, it is recommended to leave extra time in your schedule for your visit. For those coming from Sapporo or Tomakomai, the roads after exiting the Hidaka Expressway at Hidaka-Mombetsu Interchange only have one lane of traffic in each direction and passing is not possible. 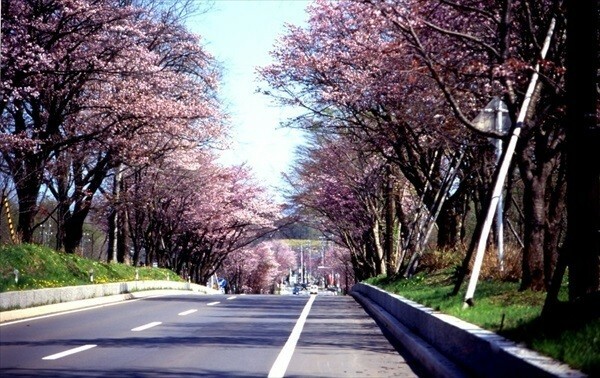 Furthermore, there are few side streets near the cherry trees so traffic jams happen easily when the trees are in bloom. Incidentally this area has also long been home to many horse farms and is still known for its Thoroughbreds. After enjoying the cherry trees, it might be fun to see some of the cute horses as well. 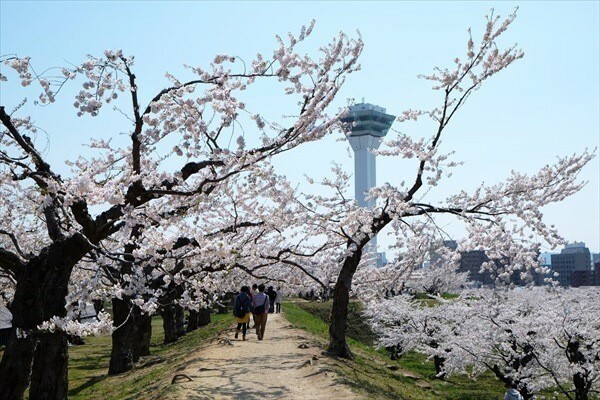 There are many famous cherry blossom spots in Sapporo, including Moerenuma Park and Makomanai Park. It was difficult to decide which ones to introduce here, but the winners are places that any visitor to Sapporo can easily get to and enjoy. First up is Maruyama Park. It has long been a favorite cherry blossom spot of Sapporo residents. Like Goryokaku, Maruyama Park only allows the use of fire during cherry blossom season. Because of this, the delicious smell of jingisukan and barbecue wafts through the air during blossom season. 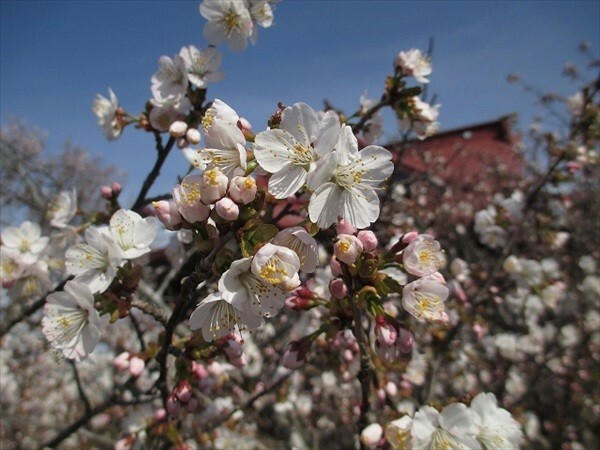 In addition to cherry blossoms, there’s one more flower to enjoy in Maruyama Park – plum blossoms! On Honshu, the plum blossoms usually bloom in mid-March, followed by the cherry blossoms in late March. But here in Hokkaido they bloom at the same time. Near Maruyama Park is Hokkaido Shrine, which in addition to cherry blossoms, is also home to 280 plum trees. While Japan has many plum and cherry trees, it’s a rare treat to get to see them both in bloom at the same time. In addition, products made from cherry blossoms and plums taken from the trees at the shrine are sold on the shrine grounds. Made from plums harvested on the shrine grounds, Jingu no Umeshu (plum liqueur) is sold for ¥800 per bottle. This plum liqueur is also used during ceremonies and rituals at the shrine. Another popular item is Sakurayucha, a type of herbal tea made with pickled cherry blossoms. This tea is made with cherry blossoms taken from the trees at the shrine and at ¥500 makes a great souvenir. 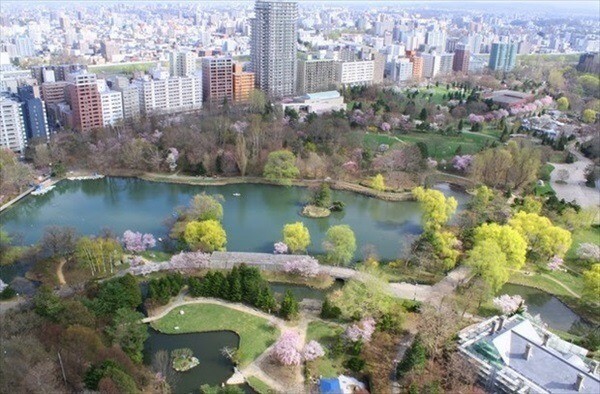 One more spot for cherry blossom viewing in Sapporo is Nakajima Park. It’s very easy to get to on the subway. 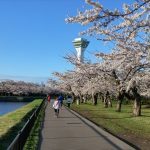 At Nakajima Park, cherry blossoms can be enjoyed for about a month starting at the end of April. 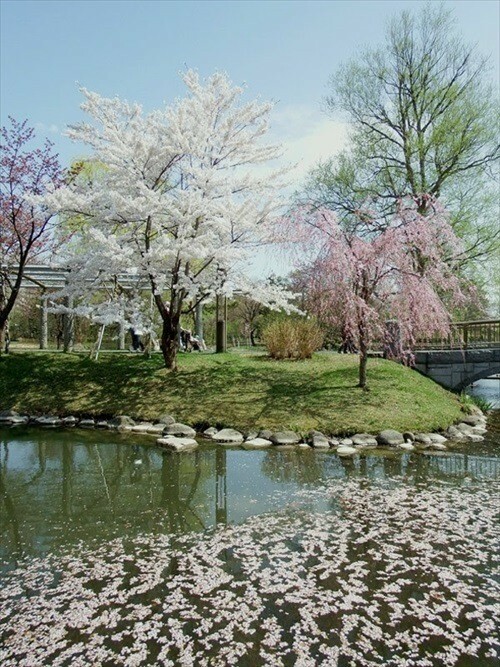 In the park there are many kinds of trees, including Sargent’s cherry, Yoshino cherry, weeping cherry, and double-flowering cherry trees. 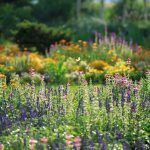 Each of these blooms in succession almost like a relay, so the blossoms can be enjoyed for a long period of time. The park’s pleasure boats also open for the season in May, so it’s possible to enjoy the blossoms from one of the boats. If you stay in a hotel near the park, we recommend enjoying a walk through the park in the morning. Many locals enjoy jogging and walking their dogs in the park, so it’s possible to enjoy a refreshing walk with them. Asahikawa Park is also famous for its cherry blossoms and is a regular stop for many tourists to Hokkaido. Southern and central Hokkaido have many cherry blossom spots, but Asahiyama Park is often said to be the most famous spot in northern Hokkaido. Asahiyama Zoo is also nearby, so it’s possible to visit both the zoo and take in the cherry blossoms. The park has around 3,500 Sargent’s cherry trees. When the trees are at full bloom, the whole park appears to be dyed pink. During cherry blossom season in early May, the Yozakura (night cherry blossom) Festival is held. 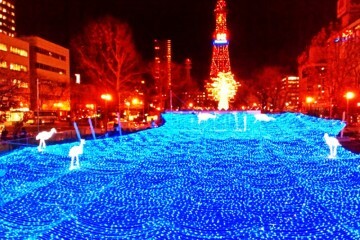 The trees are lit up at night (usually from 7 PM to 10 PM). Please note that it’s still very chilly at night in Asahikawa during cherry blossom season. Please be sure to dress warmly when enjoying the Yozakura Festival. Public transport from Asahikawa Station: take an Asahikawa Denkidou Bus bound for Asahiyama Zoo and get off at the last stop. The park is nearby. The bus takes about 40 minutes. It’s said that the cherry blossoms in Nemuro are the last to bloom in Japan. Nemuro is the easternmost city in all of Japan, and has many Chishimazakura (Japanese alpine cherry) trees. Nemuro’s most famous spot for cherry blossoms is Seiryuji Temple. On the temple grounds there is one famous tree that is 150 years old. 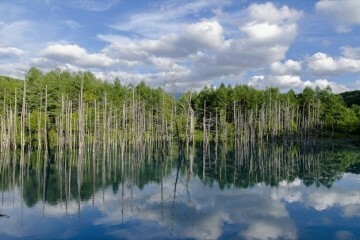 It has been designated as a tree of historical significance in Hokkaido. As mentioned before, Seiryuji is often said to be the last place in Japan where the cherry blossoms bloom. Based on data from the years 2001 to 2010, on average the blossoms opened on May 16 and reached full bloom on May 22. However, in 2015, possibly due to the effects of global warming, the blossoms opened on May 6, the earliest date recorded thus far. 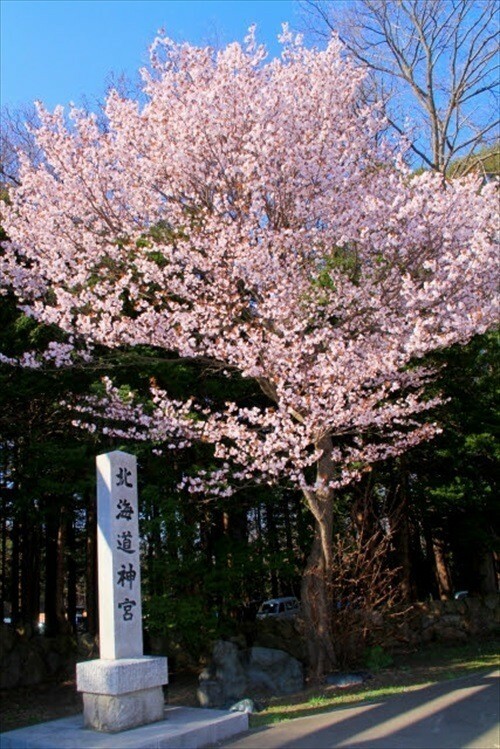 Every year the latest information regarding the cherry blossoms can be found on the Nemuro Tourist Association Website. Also in Nemuro, Cape Nosappu, the easternmost point on the four main islands of Japan, also has some cherry blossoms. They bloom at the end of May and truly are the last cherry blossoms to bloom in Japan. Directions by car: 5 minutes from Nemuro City Hall on National Route 44. Blooming to full glory after the snow melts, Hokkaido’s cherry blossoms have a beauty that is very different from the blossoms on Honshu. 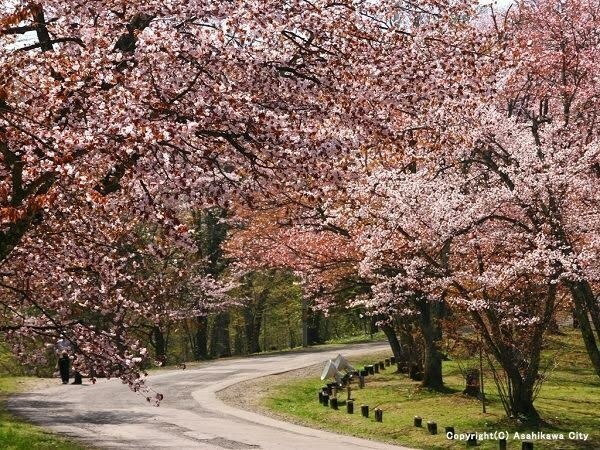 Please enjoy searching out Hokkaido’s cherry blossom spots in April and May. 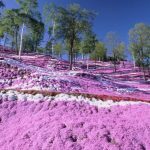 Hakodate in spring: the 4 best cherry blossom viewing spots in Hakodate! 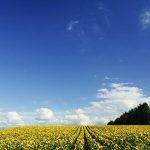 Highlights of August: enjoy the refreshing summer of Hokkaido! Springtime in Hokkaido! Here are some of our recommended tourist sites!